Image courtesy of ImageMD under a Creative Commons license. “Alcohol consumption plays a prominent role in many professional interactions, including job interviews, negotiations and informal meetings,” said Scott Rick, assistant professor of marketing at the University of Michigan’s Ross School of Business. “By introducing alcohol, managers can create a relaxed atmosphere that facilitates information exchange and relationship development. 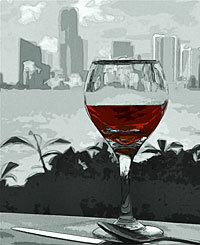 Rick and colleague Maurice Schweitzer of the University of Pennsylvania’s Wharton School conducted a series of six experiments with more than 1,700 people to measure how consuming or merely holding an alcoholic beverage influences the perceived intelligence of the person drinking the glass of wine or beer. They found that job candidates who ordered alcohol in simulated interviews were perceived as less intelligent and less hireable—though no less likeable, honest or genuine—than those who did not, regardless of whether the boss ordered an alcoholic beverage first. Moreover, even if the boss ordered the drink for the job candidate (i.e., the candidate did not choose to drink), the result was the same. This suggests that the bias does not reflect a belief that less intelligent people are more likely to consume alcohol, but rather an implicit association between alcohol and cognitive impairment.